I’m chuffed! 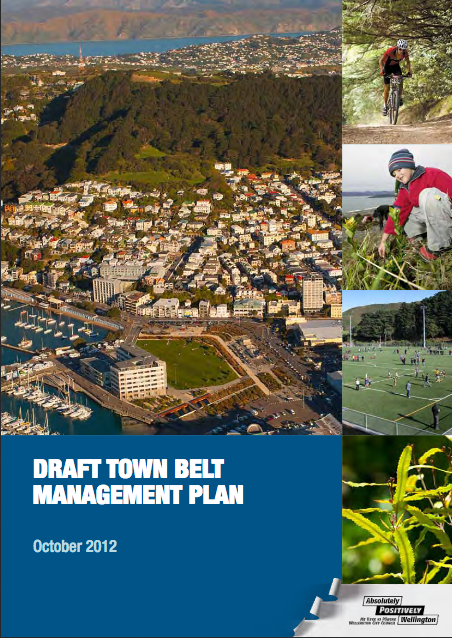 Seven years after starting work on my first project as an engagement specialist at the Wellington City Council and 1 year after leaving the organisation, the Town Belt project has been completed. Good quality policy takes a while! This is a post for public engagement junkies. It is offered to those who are looking for ways to make public engagement more effective. By any measure, the project was an outstanding success. Given the varying levels of trust in the Council at the start of the project and the range of views about how the Town Belt should be governed and used, it is a testament to good engagement that the newly created governance framework is so widely supported. The Town Belt is a large, horseshoe-shaped reserve that surrounds central Wellington. When the city was established in 1840, the land was set aside as a public recreation ground that was not to be built on. By the 1870s, about a third of the land had been removed from the reserve by the Government and developed. Developments included the hospital, schools and the university. Today, the Town Belt provides parks, nature reserves and a wide range of sporting and recreational facilities. Seven years after the project started, its public engagement could be remembered as entirely conventional. After all, submissions-based consultation was used during all 3 stages of the project. Such a perception would belie the innovations that resulted in the Town Belt project being highly commended in the IAP2 (Australasia) Core Values Awards 2014 for Project of the Year (Environment). The survey showed that Wellingtonians were most concerned about land being removed and that the Council was considered the greatest threat to the Town Belt. The workshops (more detail at the end of this post) provided an opportunity for members of the public, including those from established groups, to explore and assess together the major issues and perspectives, and to seek common ground. Diverse representation was actively recruited. Draft objectives and principles were developed using input from relevant Council departments and from the prior engagement. A large number of constructive submissions were received. The early engagement had created an interested and informed public. In addition to an agreed set of objectives and principles, the workshops laid the foundation for the productive working relationships that characterised Stages 2 and 3. An evaluation found that participants in the public deliberations found the process valuable and appropriate, regardless of their initial positions. An evaluation of the staff workshop found that officers from across the Council valued being brought together at the start of the project. The use of structured, facilitated processes meant that everyone was able to share their knowledge and concerns and to learn from each other. Most projects need more of this. With objectives and decision-making principles agreed, Council officers set about leading the development of a draft Town Belt Management Plan. This was done in collaboration with relevant Council and non-Council experts. For example, members from major stakeholder groups were commissioned to write the European and Maori history sections. The draft plan was consulted on using a submissions-based process. A range of summary documents were produced for different aspects of the plan and for different stakeholders. Efforts were made to notify affected parties. Officers met with concerned parties to work through issues. This is just good, targeted, genuine engagement practice. A sub-committee of five interested and diverse City Councillors was formed to consider oral submissions and to make recommendations to their fellow Councillors on the full Council committee responsible for the Town Belt. The sub-committee’s hearings were carried out in a less formal way with more questioning of submitters than usual and some dialogue. A significant innovation happened after the hearings when the sub-committee decided to work with the lead officer and a legal expert to consider all the written and oral submissions in detail and to develop recommendations – normally Council officers do the analysis. Twenty-two substantive changes were made to the draft plan, including a major revision of the ecology chapter, which was re-written collaboratively with the five submitters who had raised substantive issues during the hearings. Sub-committee members were able to unanimously agree recommendations even though some of the Councillors had rarely been on the same side of a vote. As a result, the full council committee accepted the sub-committee’s recommendations with little debate, even though some of their recommendations were stronger than officers would have recommended. In my time at the Council, I have never seen Councillors ‘own’ a plan to such an extent. This, I think, has to do with the elected representatives being in control of the analysis of input and also being able to work through issues outside the formal committee process. In addition to this, many submitters valued having their submissions considered in detail by the City Councillors on the sub-committee. Through stages 1 and 2, the Council decided it would forward a Local Bill to the Parliament – Parliament only considers Local Bills if it is satisfied there is sufficient community support. The Local Bill sought to modernise the governance framework, which was based on an 1873, 3-page, one sentence Deed amended by numerous subsequent Acts. On 7 April 2016, following a select committee hearing, the New Zealand Parliament unanimously passed the Wellington Town Belt Act 2016. Amongst other things, the Act enshrines the set of goals and decision-making principles that were developed during stage 1 and largely remained intact through stages 2 and 3. Getting it right is about high-quality deliberation and engagement with all interested and affected parties from the start of the project. The project manager was superb. He was very experienced, had a deep knowledge about the Town Belt, and had established relationships with many of the interested groups. While being an expert on most things to do with the Town Belt and on policy instruments such as management plans, he was open to other people’s ideas, a good listener and someone who would act on commitments and let people know what was going on. By opening up the process to members of the community, the project got to benefit from the collective knowledge, experience and perspectives of lots of people and groups – community groups often have more ‘institutional memory’ and better records about the things they are interested in than the responsible organisations. The input of the community contributed to better policy and support for it – although it should be noted that this support was not universal. Deliberation is not necessarily about consensus on everything; it’s about finding enough common ground to move forward. The project manager was the ‘project manager’ for the whole project. Given the amount of organisational change at the Council over the course of the project – new city councillors, new senior leadership team, new managers, so many new staff, so many new priorities – this was essential. Good quality work needs more stability and support that many organisations acknowledge. There was excellent planning and adaptive management. While each stage of the project was carefully planned, the Council was willing to change the plan as it engaged and learnt. This flexibility allowed others to be involved and be influential. It also allowed innovations such as Councillors being involved in the analysis of submissions. The use of deliberative process as part of an environmental planning project was new for the Wellington City Council in 2009/10 and set the foundation for the collaborative development of the Town Belt Management Plan and Wellington Town Belt Act. Given the success of this project, the Wellington City Council and other authorities should consider using similar processes for other complex and contentious issues. It could even be adapted for cycleways! Officers from policy, planning and operational departments were invited to identify stakeholders, flag issues and to identify underlying values clashes and perspectives. People from a range of interests as well members of the public with less clearly defined interests in the Town Belt were actively recruited to ensure diversity. Participants were able to explore and assess together the major issues and perspectives, and to seek common ground on objectives and principles. After attending one of the public workshops, a Maori leader asked for an additional workshop for Mana Whenua. The process for the prior workshops was adapted and used to quickly bring a group of high school students up to speed with the range of issues and perspectives so that they could assess the set of draft principles and make an informed submission. The teacher could not believe that one particular student changed her position during the process. Of course, this is normal when people deliberate. This PEPtalk was first published on 21 July 2016. You’ll see from the website and from more recent blog posts that PEP’s thinking has moved on since then!